Keith Barron was born and raised in Vancouver, British Columbia. After finishing undergraduate studies at the University of Victoria in 2004, he worked in the software industry for several years before moving to Saskatchewan to pursue his goal of becoming a lawyer. 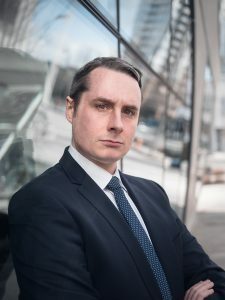 Keith graduated from the University of Saskatchewan college of law in 2016, and was called to the bar in 2017 after completing his articles with Cowley and Company. During law school Keith received several scholarships and awards, was an editor of the Saskatchewan Law Review, and prepared reports on a mental health court trial program for the Government of Saskatchewan. He also participated in clubs, competitions, moot courts. Personal Injury law appeals to Keith as he enjoys working directly with clients to help them through difficult chapters of their life. He is well suited to Cowley and Company because of the firm’s focus on working directly with clients for their welfare and recovery. When not in the office or in court, Keith enjoys seeing as much of our beautiful province as possible, and catching Canucks games whenever he can. Free Legal / ICBC Consultations! We know that legal procedures can be baffling. That’s why we take time to explain what is happening at every step in the process. We want our clients to feel at ease with the litigation process and feel comfortable enough to make informed decisions about their case. Feel free to fill out the form below. Provide us with the details of your claim, email and phone number. We’ll review your details and get back to you as soon as possible. Are you in the Middle of a Civil Dispute?